Wash and finely slice mushrooms as well as olives. Season the beef with salt and pepper. Heat up the oil in a frying pan (make sure the pan & oil are hot) before placing the beef in. Sear the meat from every side keeping the heat on high (this will take only 2-3 mins). Once the meat is seared, transfer it onto a plate. Now throw in the mushrooms and olives. Add fresh thyme (without stems),season with salt & pepper and saute (add more olive oil if necessary) until all the water has evaporated from mushrooms (about 10 mins). Turn off the heat and let the mushroom mix cool down. Place cling film on your table/work top and cover with 6 proscuitto/parma/jamon slices. Make sure the slices are overlapping each other. Now spread the mushrooms over creating an even layer. Place meat in the center and carefully fold the parma ham with mushrooms over the meat/wrap the meat using cling film. Make sure it’s rolled tight. Now take the ends and twist them until the meat is sealed really tight and has a barrel shape look. Place it in the fridge for 30 minutes. 30 minutes later: Take the meat out from the fridge. Remove the cling film. Place new sheet of cling film on your work top. 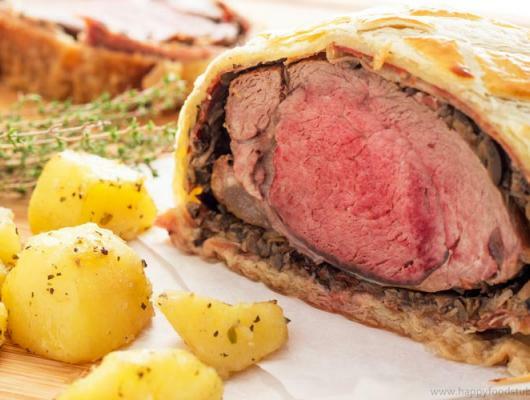 Put puff pastry over the cling film and place the meat in the center. Roll the puff pastry over the meat. Trim off the excess pastry and seal it with egg wash. Seal both ends by pinching the pastry together with your fingers. Now put the cling film over the pastry and again roll until it is tight (the tighter it is the better the final look). Place in the fridge for at least 10 minutes (you can prepare it the night before). Brush with egg wash and if you want to impress your diners then mark the pastry with some lines (of your choice) using back of your knife. Bake in a preheated oven at 200 C/400 F for 40 minutes. Take out and let it rest for 10 minutes before serving. Serve with potatoes or potato mash and/or gravy! If you are looking for a fancy dinner idea, look no further! 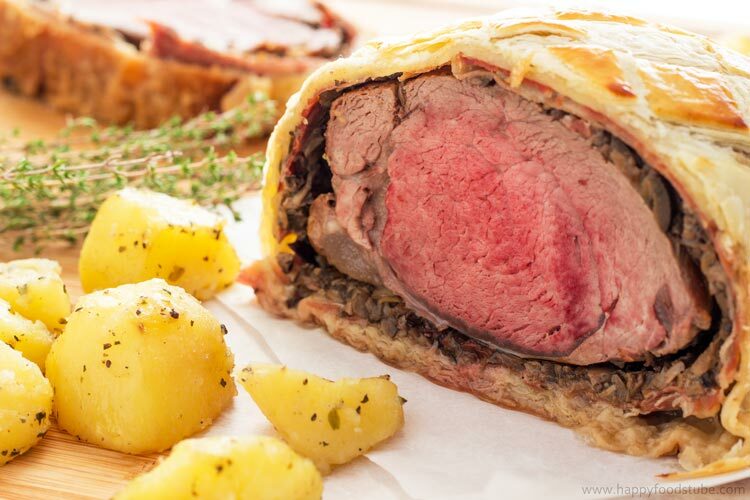 Beef Wellington is what you need to impress your dinner guests!